Is it really the last time? This might be the last time that you read my blog. This might be the last time that I write a post on this blog. This might be the last time I put up with a dropped call on my cell phone. With so many choices, every business lives right on the edge. When you were the only florist in my town, storming off in a huff cost me as much as it cost you. Now, it's sort of trivial to just type a few different letters into my browser. The Web 2.0 Blog offers 16 ways to get you going along the right path (if you’re into those sorts of things). Can you outsource your job search? Why not? You can outsource everything else. JobStuff has the details about Jobserf. I’m not sure that I care about this; I was really hoping for a full-screen video iPod. There still doesn’t seem to be any sort of proper remote for the iPod — would have been much cooler if there was a video out on the HiFi that just provided a GUI for navigating iPod content (for that matter there doesn’t appear to be any video out, which seems a little silly). What is the Origami Project? Scoble says it’s a device and Engadget claims that these are pictures from a good source; both seem to agree that it’s a new device from Microsoft. Whatever it is, the viral is pretty effective with the information on the official site only releasing information on a weekly basis — the next update is 3/2/06. Do you know what human directional advertising is? Picture the dude in a chicken suit. Got a good mental image? Good. Apparently “human directional advertising” is the technical term for dressing up in a goofy suit or holding an advertisement on a corner. I’d never hear the term before. Geocode America — latitude and longitude for specific addresses, zip codes, etc. Now that I’ve developed my short list, I’m going to have to go play with everything and see if I’ll integrate anything into my daily use. Stay tuned . . .
Apache is built into OSX? I had no idea that was the case until I read a post about it on TUAW. Perhaps I’ll turn my Mac Mini into an intranet server for my house. Ok, it’s actually not a bad list, but it’s a little hard to look at. I originally saw a version of this on Micropersuasion, but was screwing up some of the operators when I tried to make it work for my blog, so I did a Google search and came up with this site, which I thought would generate the URL for my mobile site; it didn’t. Ultimately it seems like it might be easier to make a bookmark to the Google site on your phone and type in the URL of the site you are looking to view on your mobile. I was playing around with 4INFO today and it’s pretty cool. To test the functionality, I send a SMS to 44636 with “united 352” as the subject and got a reply in about 30 seconds with flight data detail. 4INFO supports lots of things in much the same way like weather, sports scores, etc. 4INFO displays targeted advertisements based on personal information. Advertisers (including ad serving companies) may assume that people who interact with, view, or click on targeted ads meet the targeting criteria - for example, women who have searched for nail salons in a particular geographic area. All of the information that 4INFO provides I can easily access with my Treo, but I could definitely see how this would be a useful service if you did not have data services active on a phone or did not even have a web browsing option on a phone. I could definitely see a mobile carrier acquiring a company like this or simply cloning its service offerings as a driver for SMS usage instead of advertising revenue. Go It Alone! can be read in its entirety on the web. Harper Collins, the publisher of the book is attempting to support the free version with Google Advertising on every page (yes, you click through every single page of the book to read it online and every page has Google Ads on the side). In addition to the Google Ads, there is also a direct-buy Amazon link that allows you to purchase the printed version of the book; it appears as though Harper Collins has an affiliate ID set up so that they can get paid a percentage of all generated sales from the site, meaning that they would make whatever they make in wholesale plus a percentage of retail. It will be interested to see what the conversion numbers are (if Harper Collins ever releases them) and the advertising revenue generated by the site (if Harper Collins ever releases that number). I wonder what the split of Google Ads revenue is with the author (if there’s any split at all). I called United yesterday to book a flight. Normally I only book online, but I had a ticket that I had cancelled and there is no way on United.com to apply a previously purchased and not used ticket to a new reservation. As I proceeded through using the IVR phone system, I was never once given the opportunity to tell the system that I was trying to do a ticket exchange. Finally at the end of the IVR system and I arriving at the correct combination of flights, I had to say “speak to an agent” about 30 times before the system finally transferred me to a human. Surprisingly the human that I spoke to sounded non-Indian, so we were able to converse quite easily. I gave the agent the ticket number of the ticket I was trying to exchange and then was put on hold for 5 minutes. When the agent came back, he told me that he would have to charge me a $100 change fee, which I was fine with, and then $10 for a phone booking. I requested that he instruct me how to do the ticket exchange on the website and I would be happy to not take any more of his time on the phone. He replied that there was not currently a way that I could do a ticket exchange on United.com, so I informed him that there was currently no way that I was going to pay $10 in addition to a $100 change fee if there was no other method for exchanging my ticket — he put me on hold again. Five minutes later, the agent told me that he had spoken with his supervisor and the supervisor agreed to waive the $10 phone booking fee. I completed my reservation and immediately received my new flight receipt by e-mail. United offers some pretty cool bonuses for booking on United.com like receiving 1000 miles for every United.com booking; to be honest, I would have rather done the whole process described above on United.com, but United has not added that feature. I can totally understand that United is trying to push as much of their bookings to their website — if they can convert some percentage of people per year to online bookings then I’m sure they can reduce overhead costs in their call centers. However, it is absolutely ridiculous that United is attempting to charge people $10 when they have no choice but to call in a reservation because United.com does not contain the features that would have prevented the phone call needing to be made. If you need to call United for a reservation because their website does not support what you are trying to do, I suggest that you refuse to pay the $10 fee; obviously they have empowered supervisors to waive the fee in certain situations (or maybe I just got really lucky). Additional details concerning the new iPod have yet to be confirmed, including capacity and a release date, although all indications point to the Spring, possibly as early as late March or early April. I hope it’s right around April 1 because that’s when I start to get busy traveling. As an aside, I hope that TivoToGo for Mac is released right around the same time as the new video iPod. Have you heard about this Breath Pallette stuff? Uniquely flavored toothpaste to fit your life. I want to try the espresso and curry because I can’t possibly imagine using those flavors to brush my teeth. Unlike a lot of the free consumer offerings, CentralDesktop is designed for business and does cost money (ok, there is a free 25MB option, but it’s a limited number of users and doesn’t have a lot of the advanced features that paid plans options). Looking at the screenshots, CentralDesktop seems to provide a lot of the same features that SharePoint provides, but is a hosted solution, so an IT department doesn’t have to worry about the server, purchasing and supporting the software, etc. Also, CentralDesktop is available from everywhere unlike a lot of internal corporate SharePoint sites that require VPN software to access. How do you become a blogging A-Lister? Scoble wrote a post about becoming an A-Lister in blogging because he gets asked that question a lot. While Scoble’s post is interesting, I like Jeremy Wright’s take on how not to become and A-List blogger, which I found very interesting — you should check it out. Fundamentally Jeremy’s post causes me (maybe you too) to question why it is that you are blogging. I freaked out the other day when I say that direct visits to my site had dropped dramatically; I comforted myself by checking distribution of my FeedBurner feed and the number of subscriptions to my feed on Bloglines. Then I reality-checked myself: I started this blog for me and if others happen to read it, that’s great. Certainly it’s nice to be famous and nice to be able to say how many visitors you have; I think at one time or another everyone is focused on the amount of notoriety that they can get and blogging and social software certainly makes it easier than the old metrics of getting your name in the newspaper. I’ve resolved that I’m not going to look at my tracking metrics for the rest of the week, which, considering that I used to check them more than twice a day, is a big thing for me. Perhaps once I break the cycle of looking at them all the time, I’ll never look at them again. Why are you blogging? Who are you blogging for? Do you really need to be an A-Lister?
. . . and the reason is? The reason that Blockbuster exists is that VCR tapes used to cost more than $100. At least I can now access my iTunes content and iPhoto content on my Mini running Tiger, but it’s still a bummer that they haven’t provided TivoToGo support yet. Engadget is reporting that Taser will be releasing a shotgun model of their popular non-lethal arsenal. Apparently the shotgun will be effective to a 30 meter range and the projectiles will not be tethered to the unit as they are in the handgun model. I’m guessing that Taser is introducing this size weapon to compete with the current arsenal of shotgun-size non-lethal weapons that fire beanbags and rubber balls or pellets. I’ve seen people shot by Taser weapons and it’s certainly not an experience that I would want to have, though I bet that it’s better than being shot with a bullet. Why is "x" used for so many things? lax — apparently can mean “lacrosse”. Also means “Los Angeles International Airport.” Can also mean “Latin American Exchange” (ok, I only found this when I looked it up on Wikipedia, I swear) Also has a definition by itself when it’s not standing in for other things. tx — apparently can stand for “transmit” (look at a 2–way radio or ask a friendly police officer). Also an abbreviation for “Texas.” Apparently it also means “thanks” in that goofy SMS-speak. There’s even more on Wikipedia. rx — apparently can stand for “receive” (see my notes above for “transmit”). Also stands for “prescription” (ok, I have to admit that I’ve never understood why rx means prescription until I read the Wikipedia entry). Seems like you could create your own language as long as the person/people on all sides of the conversations knew what the “x” was standing in for. Perhaps I’ll become Rx, the person formally known as “Ross,” where “x” means “oss”; although I’d hate for people to think that my parents named me “prescription” or “receive,” so perhaps I won’t after all. “Windows Defender” is the new and final name for Windows AntiSpyware. Lots of improvements in the beta 2 version of this product (the name, of course, not necessarily being an improvement). And I never even got a beta invite. I did the last-minute Valentine’s day card shopping today. Albertsons was out of cards (at least the kind I could give to my wife), but there were about 10 guys in the aisle trying to figure out how to make what was there work for their special someone. Disappointed, I went to Walgreens, which still had a good selection of cards, though most of them were very large. The guy in the aisle with me kept grabber progressively larger cards, and so I made the effort to inform him that most women say that size doesn’t matter, which he found not funny at all. I was amused by the fact that he walked away with a 8x14 card after I made the comment — apparently size matters to him (or to his wife/girlfriend). I was reading a post on Engadget that has detailed instructions on how to build a scaler. It got me thinking that I actually have a scaler lying around (don’t ask) and that maybe I should try to use it to make the signal from my TiVo to my plasma more crisp and defined. One of my big frustrations with TiVo is the lack of HDMI, DVI, or component outputs; I am using s-video, but I can visibly see the difference between the component video connection and the s-video connection. If the external scaler I have works as well as the screen grabs on the Engadget post, I’ll be pretty excited. I’d love feedback from anyone out there that is a video whiz on whether or not the scaler will make a difference and anything that I need to think about when using a scaler. Basically, just to provide a little more info, I’m looking at taking the TiVo feed into the s-video in on the scaler and sending the signal through the component video out (I’m not sure that the scaler I have actually has a HDMI out on it). Just enter what your are trying to convert from (i.e., “1/4 teaspoon”) and what you are trying to convert to (i.e., “ml”) and the first result will have a little calculator symbol next to it with the correct result. The link below is an example that converts 1/4 teaspoon to ml. It’s really strange: sometimes when I log in the interface exists on the left-hand side and sometimes when I log in it’s not there anymore. This seems to be happening on both of my accounts, so I’ll just have to assume that they’re still ironing out some bugs. Read all about it on his post through the link below — it all makes sense to me. I actually liked his previous idea about every Gmail user having to pay a buck by credit card and use their real name, but we’re past that now. I did and it’s a great listen. Sure, it’s available in video too, but I couldn’t get it to work on 2 different PCs or my Mac. Believe me that it’s worth just hearing without the visuals. What exactly are customer service surveys measuring? 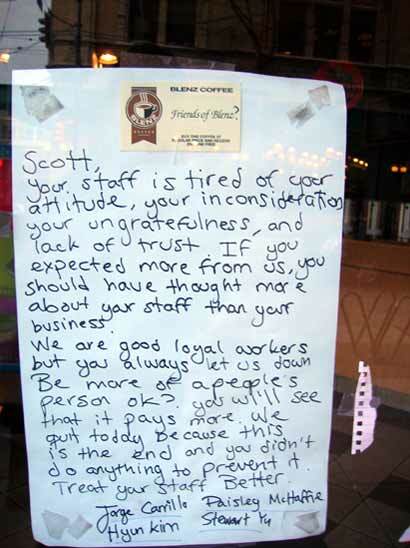 They don't measure how good your service is. Or how optimal your product is. They measure how well you did compared to expectations. They measure how well people rank you in the survey. That’s what Seth Godin says and he’s not wrong. Remember how you used to take tests that you could game if you were a good test taker? Basically those kinds of tests only tested how well you took tests, not how well you knew the material. Same difference. Seth Godin has 2 great posts about getting traffic and about how long people actually pay attention to your site. The problem, of course, is in the "get." The request has at its foundation the assumption that what you've built has somehow earned attention. "Our business model is working great--we just need more traffic..."
People never say, "how can I earn more traffic?" or "How can I rethink the core of what I'm offering so that it organically attracts people who want to see it?" Getting traffic is a little like getting a date. You can probably manipulate the system for a little while (I had a roommate in college who was great at it) but self-reinvention is a markedly better long-term strategy. If you believe Seth’s next post, then you will have left before you even get close to reading this part. Why? Fact: about half the visitors to your website leave after less than five seconds. Do you see the correlation? If you are earning traffic, chances are good that you are earning more of people’s time. And hopefully if you’re doing things right, then people are opting to subscribe to your feed and you’re not worried about them visiting your site directly. Link — How can I get more traffic? One of the assumptions built into the conventional version of K-12 schooling, private and public, is that there is some subset of human knowledge, large enough to occupy most of twelve years of school, that everyone needs to know. That assumption is false. There is a very short list of skills-reading, writing or typing, and simple arithmetic are the only ones that occur to me-that almost everyone will find worth learning. I sometimes describe it as throwing books at them and seeing which ones stick. Is your company ready for a blog crisis? Steve Rubel asks that question and provides a primer for when (not if) your company is faced with a blog crisis. It’s sure nice when someone else does the work for you. Check it out. Cutting people off in the parking lot is not a good idea; chances are that you will run into the person you cut off many times during your shopping experience. If you have one of the very large flatbed carts and you have loaded it up to the handle with cases of soda, it’s probably not the best idea to let your 10 year old son push the thing around, especially if your son cannot see over the handlebars. It is an even worse idea to walk in front of your son so that you cannot see him and then scream at him when he runs it into your ankles. Speaking of screaming at people in Costco: try not to scream at your kids or spouse in the aisles as someone might say something. Having your child hang on to the front of the shopping cart and using your child as a battering ram is probably a good way to get your child hurt and have someone call child protective services about you. Sample carts are for samples. Take your sample and move along — do not hang out in front of the sample cart and block everyone else while waiting for the next batch of samples when you are the person that ate the entire last tray of samples. The hot dog and soda at the concession stand are only $1.50. I have never been to a Costco that has enough room by the entrance for you to walk in 5 feet and stop. Please realize that all the people that you were competing with for a parking spot are also trying to get into the store. You can get into Costco without a Costco card fairly easily (I accidentally used my Safeway card yesterday), but you will need it when you go to check out. Have your card available when you check out. Costco only takes American Express or Costco cards, so don’t get upset when you can’t use your Visa. Costco has a nifty little device that will print all of the information on your check, so if you’re paying by check, sign it and hand it to the cashier and let the technology do the work for you. When buying raw meat at Costco, use the bags that they provide to drop the meat in. I know that the meat is already wrapped in plastic, but the bags are there for a reason and it will keep you from getting meat juice all over your 400 pound box of Tide and your bag of beef jerky. Most of all, if you go to Costco during a busy time, simply acknowledge to yourself that it’s going to be busy and try to slow down and relax. Steve Rubel posted about StikiPad, which is a really cool site for creating wikis. Rubel has screenshots on his post, so check it out. Show your Skype status on a blog. This was originally posted on my HOBDenver blog, but I wanted to share it with all Strategize readers as well. I bet that you’ve never heard of Beatport. Beatport is a local Colorado company serving paid downloads to the somewhat niche market of dance music. You will find remixes of popular artist tunes and original content all available for sale. It used to be that you couldn’t get a lot of the great dance music and DJ remixes in an easy way, but Beatport has changed all that. No special software downloads required, everything works directly in the browser and works perfectly with Firefox. As you would expect with any digital music store, you can play track samples, some songs are available as singles, and some songs are only available as part of an album purchase. I was checking out “Their Low The Singles 1990–2005” Parts I & II by The Prodigy, a band I still enjoy listening to — haven’t seen those albums on iTunes. Beatport offers a variety of delivery methods: instant delivery (mp3 or mp4 tracks), mail delivery (mp3, mp4, or wav CDs). Oh, and Beatport averages something like 75,000 downloads per week. Very interesting: Google is offering Gmail accounts for your entire domain. They note right on the front page that all of the e-mail is hosted on Google’s servers. Please note that you will have to go through a qualification procedure to qualify your organization for the beta (and you’ll need a Google ID to access the qualification procedure). Did you know that you can actually see the plain text version of passwords you store in Firefox? I didn’t until I read a post about it on Lifehacker. Luckily you can secure everything stored in Firefox by setting a master password — full instructions in the link below. Steve Rubel’s done it for AdWeek and Mediapost using Google News and Feedburner. Check it out. The simple solution, of course, is simply to RSS-enable your news site. That’s the name of RIM’s work-around solution if the existing Blackberry service is shut off. See the links below if you want more information. The Art of Recruiting — The art of recruiting is the purest form of evangelism because you're not simply asking people to try your product, buy your product, or partner with you. Instead, you are asking them to bet their lives on your organization. Can it get any scarier for them, and tougher for you, than this? Guy has a lot of great points and things to think about if you a responsible for any type of recruiting/hiring at your company. The Art of Schmoozing — It's taken me twenty years, but I've figured out that it's much easier to make a sale, build partnerships, create joint ventures--you name it--with people that you already know than with people you just met. The key is to establish a relationship before you need it. And this is why I'd like to provide the art of schmoozing. Schmoozing is tough stuff and it’s hard to do right because there isn’t a lot of information on how to do it right, which is what makes this such a great post by Guy — 20 years of experience distilled into a blog post. The Effective Emailer — I have strong feelings about email etiquette and what it takes to get your email read--and answered. As someone who gets dozens of emails every day and sends a handful of emails every day to get strangers to do things (“digital evangelism”), I offer these insights to help you become a more effective emailer. I have strong feelings about effective e-mailing as well that tend to be nearly the same as Guy’s. Please read his post and apply his rules today. The Art of Rainmaking — You can blow all the smoke that you like about brand awareness, corporate image, and feedback from early adopters, but you either make it rain or you don't. Sales is just damn important. In many companies, salespeople report to people with lots of other stuff on their plate and those supervisors fail to realize that the most significant bottom-line revenue impact that they can make is spending most of their time supporting sales. Hell, I’ll probably buy them for my daughter. The cool part is that you can do this with any audio source, including DRM’d iTunes files; the bad part is that it’s pretty complex. After a morning of getting absolutely crushed and overwhelmed by the response to its debut, Zillow is back up. Essentially Zillow provides instead valuations and data on homes all over the country. To test the service, I pulled up my house and was amazed to see the Google Maps satellite integration on my house and houses on my street with home values floating over each house. Going further, I checked out comp data, sales data, home facts, etc. and everything was right on. This changes everything in the real estate business — now people will be as educated about home buying as they are about car buying: the curtain has been lifted. I could not find a cohesive set of instructions on how to transfer e-mail from uReach to Gmail, so after figuring out how to do it myself, I’m posting the full primer. All of the following instructions involve using a machine running Windows XP SP2 — I’m sure there are ways to do this with other operating systems and earlier versions of Windows might work exactly the same way; I’m just telling you what I used as your mileage may vary. The following instructions assume you have a uReach account that you want to transfer mail from and a Gmail account that you want to transfer e-mails to. Be sure the computer you are using has WinZip. If for some reason it doesn’t, download it and install it — I suggest that you install it in Classic Mode. Download gExodus. Once done, you will have a zip file — be sure to use the WinZip Extract button instead of dragging and dropping the files out of the archive. The first time I installed, I did a drag and drop and the program could not find the Python dll file. Once you have extracted to whatever folder you have chosen, go ahead and double-click the gExodus exe file to make sure it works. Keep gExodus minimized throughout this process until I call for it in the instructions. Download and install Thunderbird. Once installation is done, launch Thunderbird and cancel out of the wizards. Unless you are going to continue to use Thunderbird, there is no reason to waste time filling in any information. Keep Thunderbird minimized throughout this process until I call for it in the instructions. Make sure there’s a copy of Outlook Express installed on the machine that you are using. Open Outlook Express and cancel out of all the wizards unless you plan on continuing to use Outlook Express. Keep Outlook Express minimized throughout this process until I call for it in the instructions. You need to be using a broadband connection to make this process easy. I cannot speak to how easy or hard this process would be if you are using dial-up; go sit in Starbucks if you have to. Repeat this process for each of your archives. Due to how Gmail works, I would suggest consolidate all non-Sent items into the Inbox. Note that the red letters represent items that will be unique to your system. Under “Label”, you can add a label if you really want to, but read the example below the box — I did not use this when I did my imports. The “Progress” box will let you know about any errors, when everything is complete, etc. gExodus essentially forwards all of the e-mails in the file you have decided to import into your Gmail account — while the To and From information is retained, the date information that shows up in Gmail will be the date and time the you run gExodus; there is no way that I could find to fix this issue. Every e-mail shows up in Gmail as an unread e-mail, so you will need to do a select all on every page and mark every e-mail as read. 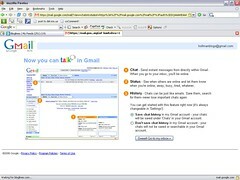 Gmail is smart enough to organize everything into conversations, however, mail from you in uReach will not show up as from “me” like conversation originating in Gmail do when you are sending mail from your Gmail account. If you have any questions, feel free to let me know and I’ll do my best to help. I accept no responsibility at all if something gets screwed up by your trying to follow these instructions; it’s obviously a complex process — you should feel good about the fact that, unless you delete the e-mails from your uReach account, uReach does not immediately delete items in your account during archiving. Even though their website is completely overloaded, Songbird, the open-source alternative to iTunes, has launched for Windows today. Although it’s not supposed to be official until tomorrow, Google Talk is active in both of my Gmail accounts. The interface is clean and simple and I like having Google Talk integrated into Gmail with a written, searchable record of my conversations. Further, I like having the ability to interact with chats the same way that I do with e-mails. The demise of the CD accelerates. And Waiter Rant is here to define you by what you order. Ok, what Malik suggests are not going to give you a full keyboard, but they are going to provide you with a lot of functionality. Note that his suggestions will probably not work on Verizon phones as Java support is required. There are a lot more figures and details in the post, so if you are interested, I suggest reading it. You can watch them separately, or watch them all back-to-back. No sponsorship on the Google Video page. Qwerky provides explanations for a lot of Web 2.0 company names. Check it out. Just check out the Superbowl page on iFilm. SnipURL — Is it just me or do some companies just generate the most ridiculously long URLs? SnipURL turns long URLs into short, manageable URLs. I’ve just started using SnipURL, but I’ve got to say that I am really impressed; I definitely like the ability to track click volume through the snipped URLs, so expect to see more snipped URLs on my blogs (please note that I will never snip links that go direct to other blog posts that I might be referencing, only really long and stupid URLs). ClipMarks — Web content clipping service that allows you to clip portions of pages, entire pages, text, pictures, etc. I’m not sure why I neglected to include this on the initial list because I use it quite extensively. The vast majority of my clips are private, but I am going to be working on tagging and getting a lot of the content public over the next month. YouSendIt — A service that hosts large files and sends an e-mail link to those files to and e-mail address rather than killing someone’s e-mail box. I’ve found that as Powerpoint files and graphics get larger there are less and less peoples’ mailboxes that will accept massively large files. YouSendIt hosts your files on their server and allows people for whom you provide e-mail addresses to access the file via a web interface. Certainly I think about the sensitivity of items that I post to their site, but it’s a great service that I’ve been using for a few weeks. Meebo — A website that allows you log on to AIM/ICG, GTalk/Jabber, Yahoo! Messenger, and MSN. I’ve been using this so much more than Trillian that I’ve uninstalled Trillian from my computer. Part of the reason that I forgot the services above in my original post is because I don’t have them cohesively organized. What I’m thinking about doing because I keep all my bookmarks on del.icio.us is putting all my critical web apps in my bookmarks folder on Firefox and then using the bookmarks sidebar so that I can easily access them. In addition, I’m going to come up with a unique del.icio.us tag for all of the sites so that I can open the del.icio.us site in a tab if I’m not using my computer. If anyone has another suggestion on how to do this, I’d love to hear it. I suppose that I could use a personal start page like Pageflakes (which, by the way, is now working with Firefox) or Protopage, but I have not yet found a favorite. I first read about coComment yesterday on Scoble’s post about it, so I headed over to check it out. coComment is in beta, but is accepting e-mail addresses for invites, so I left mine and was surprised to find an invitation this morning when I checked my e-mail. Install a coComment bookmarklet on your toolbar — bookmarkelts are available for Firefox, IE, and Safari. Note that this is a one-time process and does not need to be repeated. Go to the blog post you just commented on, and find your comment. Select the text of your comment in the page. Click on the coComment bookmarklet you installed in your browser. If the relevant blog information (eg website address) does not show up automatically in the given fields, enter it. Seems way easier to try and do this correctly the first time. So here’s what I’m going to do: I’m going to publish this post, leave a comment on it, and then come back and edit this post with my experience from both the user side and the site administrator side. The edit will be slanted towards Blogger because that’s the platform that I use.
. . . ok, so I entered the test comment that you can find by clicking the comment link. I entered the text of the comment, selected the radio button to designate it as an anonymous comment, and then input the text for the optical barrier (not sure if I needed to do that). After I had entered everything into the blog, I clicked the coComment bookmarklet, which brought up a small, green window that prompted me to enter my nickname/e-mail and password for the coComment service. After I entered that information, I noticed that a small logo had appeared next to the “Login and Publish” button on the blog comment page that had white “CO” lettering on a blue background with my nickname to the right of it. Not seeing anything else happening, I hit the “Login and Publish” button and got an error message about cookies, which is when I realized that the eTrust Firewall was blocking the cookies from coComment. I added coComment to the firewall, disabled cookie blocking, and hit the “Login and Publish” button again — a small khaki-colored window showed up telling me that my comment was being submitted to the original blog and coComment and that was that. Now here’s something interesting: I moderate my comments on Blogger as the blog administrator. The post below immediately showed up in coComment even though I had not yet actually approved comment publishing in Blogger. I suppose this doesn’t really matter too much, but it’s interesting to note. I then commented on the post while logged into my Blogger profile and without using the coComment bookmarklet. Now, nothing showed up in coComment because I did not use the bookmarklet, exactly as I expected. There is a way to set up alerts, but I have not done that. TechCrunch has a post about coComment with some screenshots. I have to say that I’m pretty impressed with the product and will be using it extensively. Anyone running Pandora on their Nokia 770? I’m just curious because I can’t seem to get it to work on mine. I think it has something to do with Pandora being a Flash-based player. Please let me know if you’ve figured out a way to get this working. No, I’m not replacing Strategize. The address of the new blog is http://hobdenver.blogspot.com and I would appreciate if you give it a look. Content is a little light at this point as I recently finished locking in the template, making adjustments to the template, building a supporting Squidoo lens, etc. I work for House of Blues Concerts in Denver, so the content on my other blog will be House of Blues Concerts and music-focused. I’m happy to address any questions that anyone has (to the point that I can do so legally) and would appreciate any questions to get the content flowing. In perusing the blogosphere, I’ve found that the music business is very under-represented, so I’m going to attempt to give as much of a view “behind the curtain” (or behind the barricade) as I can. AutoBlog is reporting that Microsoft Windows Automotive, named “Blue & Me” to characterize bluetooth integration and a one-to-one relationship with the driver, will debut at this year’s Geneva Auto Show. There are apparently all kinds of features like voice operated controls and a USB port in the glove compartment that is compatible with all kinds of smartphones, MP3 players, and memory sticks. No mention of how the ctrl-alt-del combination is entered if you have to reboot. I still haven’t received an invite to 30 Boxes, but Thomas Hawk e-mailed me about his post reviewing the service and it is complete with screenshots. After reading his post I’m even more excited to be able to try out the service. Google has a tool that allows you to send a text message to any cell phone in the United States. Check it out.